The original owner of Pelorus was a Saudi businessman who already owned a 72 metre motor yacht that he wanted to extend. Designer Tim Heywood was commissioned to investigate this possibility but could not find a really satisfactory result and instead proposed a new yacht of 85 metres. Extra features were added until the overall length reached 114.5 metres, making it the 11th largest yacht in the world at the time (now 24th), outranking Lady Moura by a considerable margin. Easily the largest yacht to be built by Lürssen at the time, she was too big for the parent yard and had to be constructed at the Krogerwerft subsidiary. The word yacht seems hardly appropriate for any vessel over 100 metres in length: Pelorus is clearly a ship in every technical sense. Her two 3,900kW Wärtsilä V12 engines are the kind you might expect to find driving a car ferry, while her four 465kVA alternators could light up a small town. At least 40 crew are always on board and are regularly rotated so that the vessel can stay in commission almost permanently. 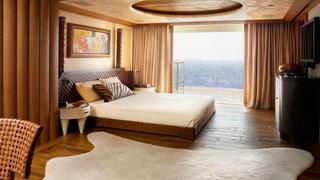 Extra cabins are provided for visiting technicians or guest's personal staff. The huge size of Pelorus made it possible for Heywood to include exceptional features such as the top-deck lido with two swimming pools and the vast sea-level platform that is created by opening the transom. Two helicopter pads are provided, and large doors in the hull side open to reveal a cavernous tender deck containing a wide selection of small boats. The owner’s suite, which enjoys horizon-to-horizon views, includes a private deck that cannot be overlooked from other parts of the vessel, while, as an example of the ingenious use of opening platforms, one guest suite has an entire wall that lowers to form a verandah. The hull design is based on the same powerful outline as Carinthia VII, with a high forebody and reverse sheer sweeping down towards the stern, but in this case Heywood added a line that curves down towards the bow and was inspired by the armour belt on HMS Belfast, which he can see from his office window. The immense task of designing the interior was taken on by Terence Disdale, who created an informal beach house atmosphere using natural materials wherever possible. Many cabins, for instance, use distressed planking as floorboards, though in reality they were specially made from new. While it is difficult to maintain a casual atmosphere in such a large and sophisticated yacht, Disdale's informal style of extreme luxury is brilliantly successful. After Pelorus was delivered in 2003, the owner enjoyed one long, glorious cruise and then decided to sell. Perhaps surprisingly, she attracted an immediate waiting list of potential buyers eager to acquire one of the world's most spectacular yachts virtually brand new and ready for use. 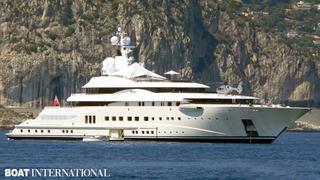 The top bidder proved to be Roman Abramovich, who made Pelorus the first of his ever-expanding fleet of giant yachts. In May 2011 media mogul David Geffen bought Pelorus for an estimated $300 million. It was his second superyacht purchase within seven months, having bought out Larry Ellison's share in Rising Sun in October 2010.